What does recycling look like to you? For most of us, it means sorting items into colored bins and putting them out for collection on the right days. Of course, this type of recycling has its limits; you can only recycle so much at a time and things like scrap metal are not an option. If you have any amount of CRV or scrap metal to recycle, Ecology is here to help. Our Fontana recycling center is just a short drive from Upland, giving you easy access to drop off your recycling and collect the redemption value on those items. We streamline the process and offer compensation so you can benefit from your recycling efforts in more ways than one. All you need to do is team up with us at Ecology. 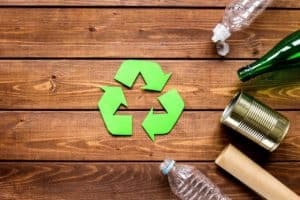 Most of us can answer this question in a vague manner: we should recycle because recycling benefits the environment. But for most, we don’t really understand it beyond that, or even how it benefits the environment. 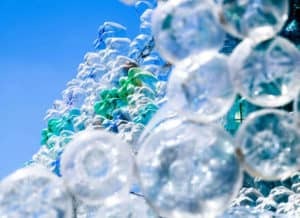 So, why exactly should you make recycling a priority? To start with, everything that is thrown away and is not biodegradable is a pollutant. You toss these items and they sit around in landfills, at best-doing nothing. At worst, they seep chemicals that contaminate the environment. Recycling cuts out steps in the manufacturing process. The steps that are cut are often very harsh on the environment, requiring large amounts of water, mining, and logging. Recycling items require less energy than manufacturing them from scratch. This results in fewer emissions and less demand on our natural resources. Finally, when you recycle with Ecology, you get a concrete, direct benefit to yourself: you earn money. This isn’t an environmental benefit, but since it helps you help cut down on pollution and environmental strain, we believe it is important. Scrap metal is a term that makes us think of industrial waste, but believe it or not, you probably have scrap metal lying around your home. Some common scrap metal recyclable items you might have around the home include outdated and broken appliances, car parts that are no longer in use, wiring, hardware, and bikes. If you have any amount of scrap metal around your home or business, bring it to Ecology for large amounts. Not only will we take it off your hands, but you will earn money for it. How much money? Well, that will depend on how much scrap metal you have and what type it is. Scrap metal comes in two categories: ferrous and non-ferrous. Let’s take a look at how these two types of scrap metal are different from each other. Ferrous metals have a special quality that makes it easy to tell the difference between them and non-ferrous metals: they are magnetic. So if you are unsure if your metal is ferrous or not, all you need to do is test it with a magnet. Ferrous metals contain iron and steel and are very common, used in construction, motor vehicles, and household appliances. But don’t feel like you need to check if your scrap metal is ferrous or separate ferrous metal from non-ferrous metals; we will do that for you. Once your scrap metal is at our recycling center, we use a large, powerful magnet to pull the ferrous metals away from the non-ferrous ones. With us, recycling is an easy process for you. Ultimately, ferrous metals are not as valuable as non-ferrous metals. Despite this, we offer excellent compensation rates so that the effort on your part is still worth it. Plus, you will be clearing out space in your home and helping to keep Upland clean. As you now know, non-ferrous metals are those that are not magnetic. This means that they can contain any one metal or mixture of metals except iron or steel. Some common non-ferrous metal to have around the home include bronze, aluminum, copper, and stainless steel. You can find these metals in many items, such as window frames, plumbing systems, bicycles, and car parts. We offer the best rates when purchasing your non-ferrous metal at our recycling center. When your state is as naturally beautiful and diverse as California is, you work hard to preserve it. 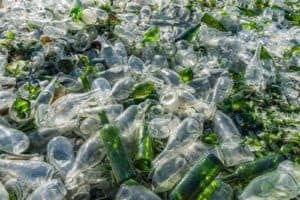 As such, the State of California has adopted many recycling initiatives to help encourage residents to make the extra effort to recycle. One such initiative is the CRV program. Through this program, the state pays you when you recycle specific items. 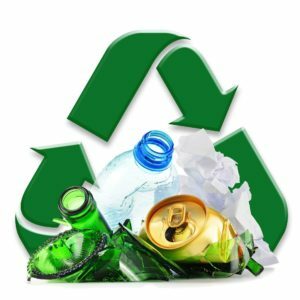 What items are considered CRV recyclables? 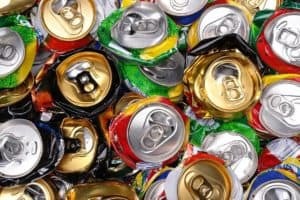 Soda, beer, and juice cans and certain glass containers, like those for soda, beer, and wine. 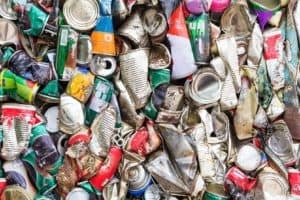 If you have ever wondered why some people will collect cans to recycle, this is why. Here at Ecology, we are proud to be an integral part of the CRV program and can process and pay for your recyclables at our recycling center near Upland, Ca. Curious where the government gets this money to pay you for cans and bottles? They get it from you, not in your yearly taxes, but when you purchase items in CRV containers. These items all have an extra cost built into their prices, which is given back to you when you recycle them. If you come with 50 items or less, we pay you per item. If you have more than 50 items, we pay you by weight. As long as your CRV items are clean and dry, you can bring them to our recycling center near Upland. 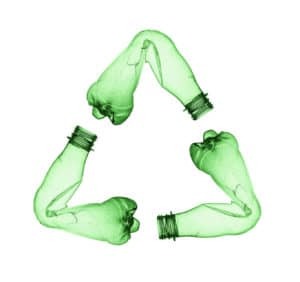 Ecology is committed to protecting the environment through our recycling efforts. Over the years, we have learned a lot about what motivates people to recycle and what stops them from doing so. And the biggest factor preventing people from recycling is that they feel it isn’t convenient. To help, we have worked hard to streamline our process and make it as easy as possible for you. Our recycling center is conveniently located for many area residents, including those in Upland. If the drive doesn’t seem worth it for smaller lots, you can make it a collective effort with friends and neighbors. If you have industrial recycling needs or a big project or collection effort coming up, we offer a special service to make it simple for you. With this service, we deliver roll-off bins in various sizes and collect them and replace them when full, if replacement is needed. You can use this as a one-time service or schedule it as often as needed. If you have items you wish to recycle but are not certain if they can be accepted at our recycling center, call us and ask. We are happy to help you determine if your items can be processed by us. Ecology is committed to making our communities cleaner, healthier, and more pleasant to call home. When you recycle with us, you improve Upland while also earning yourself some extra cash and clearing out the clutter. We do not care how large or how small your recycling load is; we are always happy to help. To learn more about any of our recycling services or our current compensation rates, give us a call. We look forward to helping you recycle.